Simon Fann makes a long overdue return to the studio; Simon works tirelessly to fill Grampound Community Hall with superb theatre performances, today we look forward to some of the upcoming shows we can enjoy due to Simon's passion for his work. Kate Osbrink of To Life Productions makes a welcome return with news from her Youth Theatre and upcoming events. Caya Murphy is on the phone, looking back at Helston Theatre Company's run of Whistle Down The Wind at the Epworth Hall and looking forward to their upcoming run at the Minack which opens on April 20th. Caya plays Swallow in the production. Cornwall Metal Artist Thomas Thrussell joins us today. Thomas and his Dad Gary create amazing work from their home on Bodmin Moor and their pieces are highly prized while their fabulous Rook With A Book is a permanent fixture in Fowey; Fowey Festival are currently holding a competition with 6 miniature Rooks up for grabs.The family story behind the company is fascinating, tune in to find out how it all started and how you could win a miniature Rook at Fowey Festival. 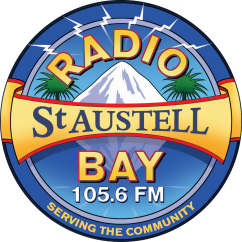 St. Austell Players open their Spring show on 15th May, actor Rose Lancaster joins us for the first time this afternoon with news from rehearsals for 'Accidental Death Of An Anarchist'. Rose plays the role of Leatherjacket in the play. Richard Hope Pears returns with news from his latest production with Tywardreath Players, DuMaurier's House On The Strand. The performance runs from 21st - 25th May at Marsh Villa Gardens in Par just a stone's throw from Tywardreath which DuMaurier used as the setting for her book.